Online cinema ivi is the largest online cinema in Russia, with a monthly audience of 48 million unique users. It presents a huge catalog of films, cartoons and TV shows from all the major Hollywood studios, as well as the best European and Russian content creators: a total of more than 62,000 content units in HD quality The ivi service is available in Russia, the CIS and, from 2016, all over the world. Ivi content can be viewed on all devices - Smart TV, computers, mobile devices Android and iOS, as well as game consoles. Online cinema viewers also have access to original audio tracks and subtitles. 3. 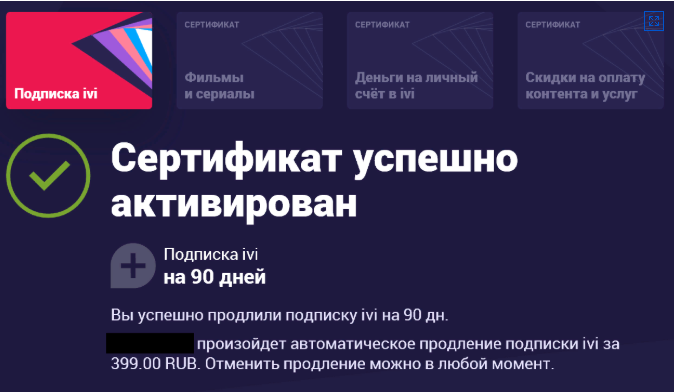 Go to the “Activate Certificate” section (https://www.ivi.ru/cert) and enter the promotional code received. The service is provided only if the user indicates on the data service his current bank card, in accordance with the User Agreement (http://www.ivi.ru/info/agreement) and the Rules for Using Certificates (http://www.ivi.ru/ pages / certificate / rules.pdf) of the ivi.ru service. The certificate can not be returned and exchanged for cash. You can activate one certificate for one account. ATTENTION! Promotional codes of this type can be used 1 time for 1 account. That is, if you previously bought a coupon of this type from me or from someone else and used it on your account, then you will not get to use this type of coupon for this account. There will be an error: "The limit of activations of this certificate has been exhausted". But, they can be used on a new account. Return money for people with a similar error - no. Use the promotional code on the new account. По началу возникали проблему, но потом связался с продавцом, тот всё объяснил, и теперь у меня есть подписка IVI на 90 дней, спасибо продавцу, всем советую именно этого продавца! account byl istorii po certifikatam. proboval na iphone 4erez prilojenie, proboval na TV i v browsere. zatem zaregalsya pod noovym accountom i vse ravno piwet ne udalos: vsegda odna i taje owibka, 4to nevozmojno aktivirovat na etom ustroistve, poprobuite drugoe. na kakom ego ewe probovat? Активация на устройстве под ос Android. Сертификат рабочий. Реакция продавца молниеносная, сертификат заменил. Всё работает. Спасибо! Всё работает, если собирайтесь покупать нужно будет привязать банковскую карточку, я привязал виртуальную от Qiwi и всё работает. Все честно, оплатил и моментально получил товар!